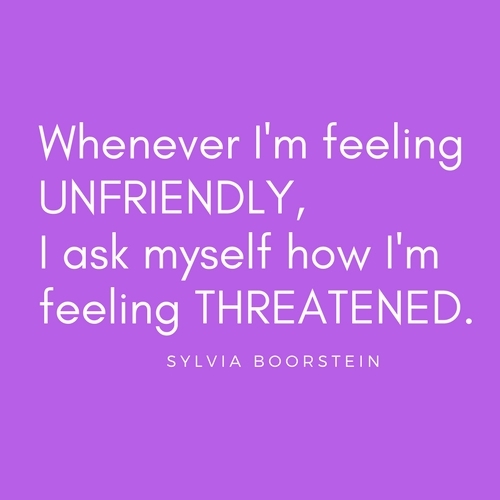 “Unfriendly” substitutes for the full range of sad and angry emotions possible. 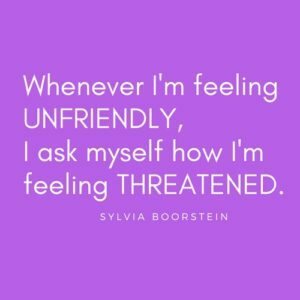 Boorstein simplifies her mental check-in with curiosity when she notices herself shifting away from friendliness. Sometimes our instincts are accurate, and we are threatened. Other times, no threat exists. I find myself feeling unfriendly after repeated requests to finish a meal, get dressed, get out the door…Don’t these children know what’s good for them? My job as a good mother raising responsible people feels threatened. Loose Legos on the floor? Mega threat or so it would seem from my mounting fury. ← What if someone is watching?